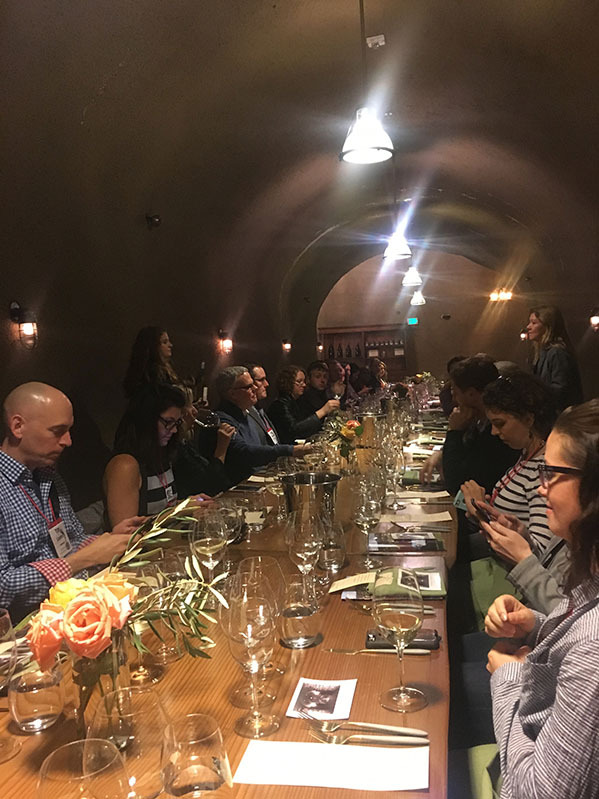 One of the most exciting parts of the annual Wine Bloggers Conference is the excursion dinner at an offsite location (most times at a winery with catered food). 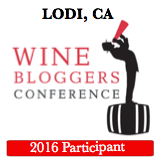 This year, we bought our tickets ahead of time so we could join our friends Neal and Alyse of Winery Wanderings, who we had met at the 2016 Wine Bloggers Conference in Lodi. They bought their tickets as soon as the Thomas George Estates excursion was announced, and we did as well soon after. The dinner experiences are a hot commodity at the WBC. 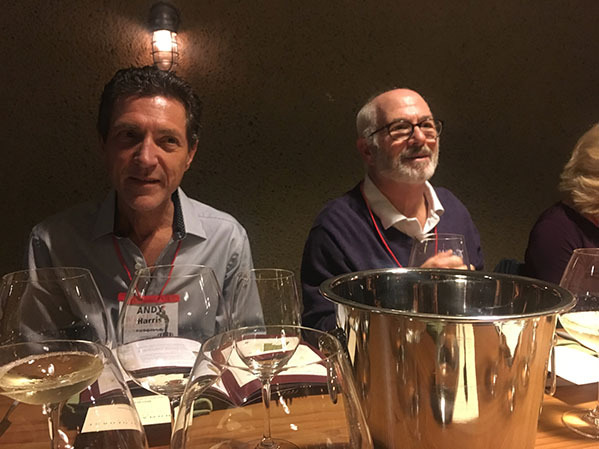 This time, the tickets were only $20 per person, and I’m not kidding when I say it was the best Andrew Jackson I have ever spent on a wine and food pairing! Don’t believe me? I have the pictures to prove it. I’ll try to curb my enthusiasm as I detail the evening, but I have to admit I felt like royalty from the moment we left the conference hotel to the moment we returned. We met our dinner group and loaded on to a limo bus. Below is a photo of us on the bus, and you can see the excitement in our faces! 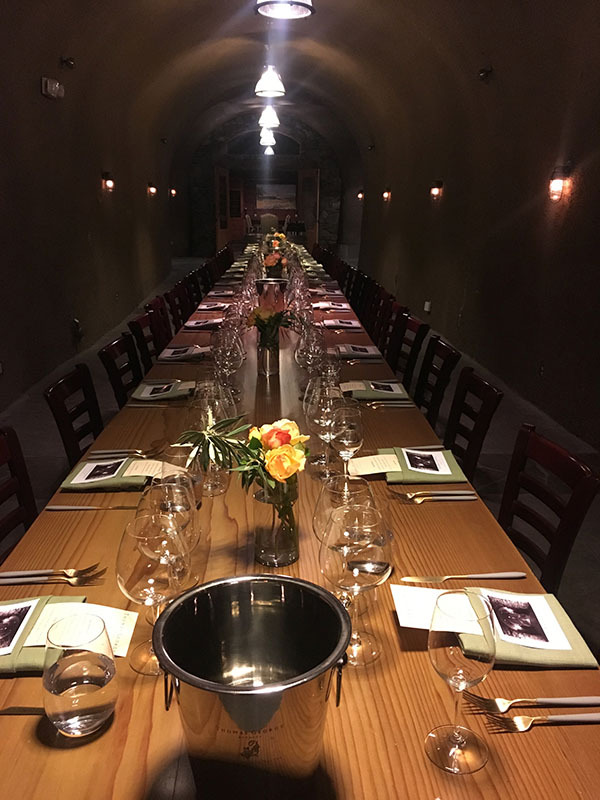 We heart wine dinner excursions! 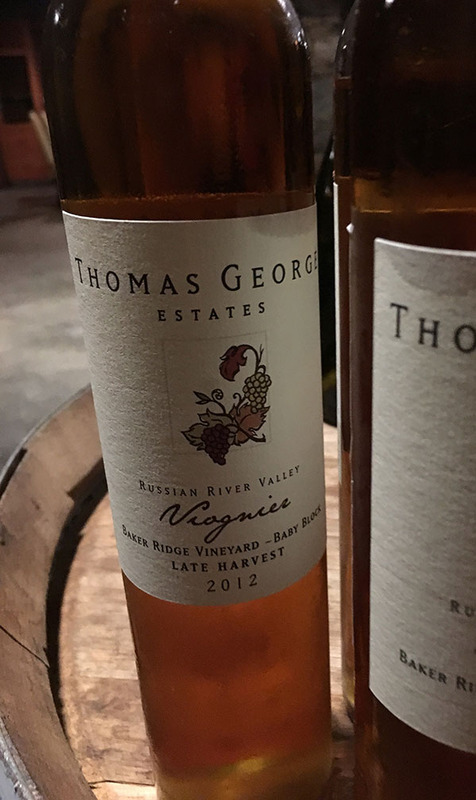 After a long and bumpy ride, we arrived at Thomas George Estates–a bit of a mystery spot for me, because I could not find much information about them on the web. After getting off the bus, I was pleasantly surprised to see our group was being escorted into a wine cave! We were led into a foyer area and presented with a charcuterie spread from Black Pig Meat Company the likes of which I had never seen before. 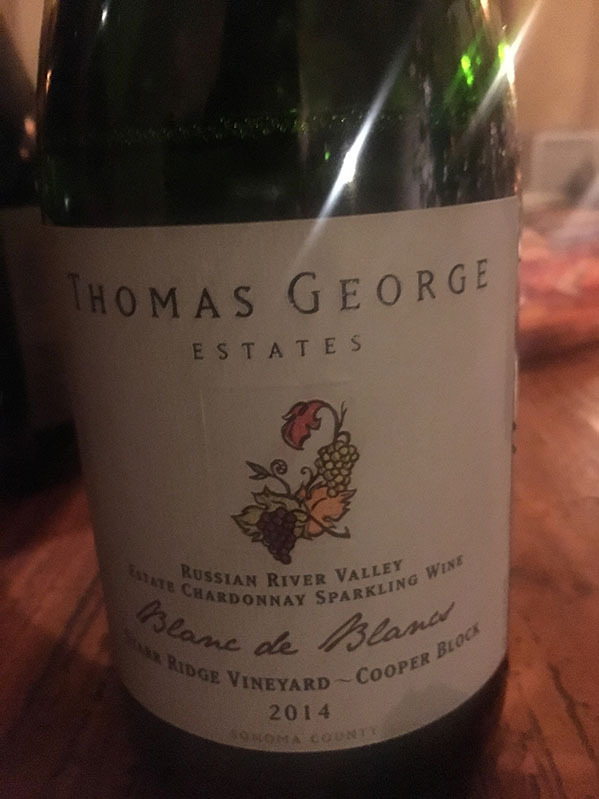 Our glasses were also filled with Thomas George Estates Blanc de Blancs, an estate bubbly made from chardonnay. We mingled amongst ourselves while sipping the sparkling wine and enjoying our selections from Black Pig Meat Company: Cured Meats, Roasted and Marinated Vegetables, and Hummus with Crostini. I snuck away from the group to take pictures of the tables where we would later be dining. The attention to detail of the table setting was remarkable. Plus, I took a peak at the menu for the evening and I could hardly wait for what was to come! 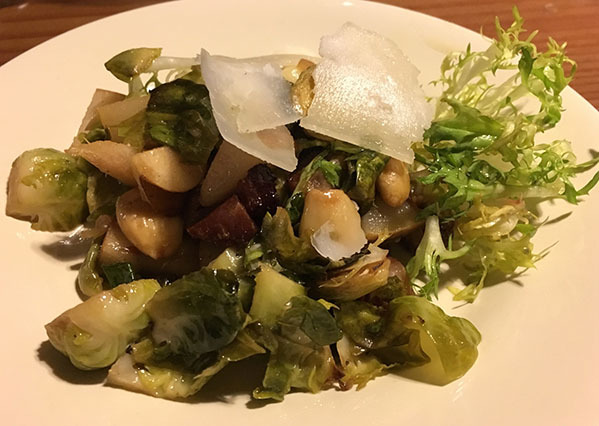 Our first course of the meal would be a roasted Brussels Sprout Salad, with Black Pig Bacon, Asian pear, Marcona Almonds, Aged Sherry Vinegar, and Bohemian Creamery “Capriago”, an asiago-style cheese made from goat milk and aged between 8 and 10 weeks. 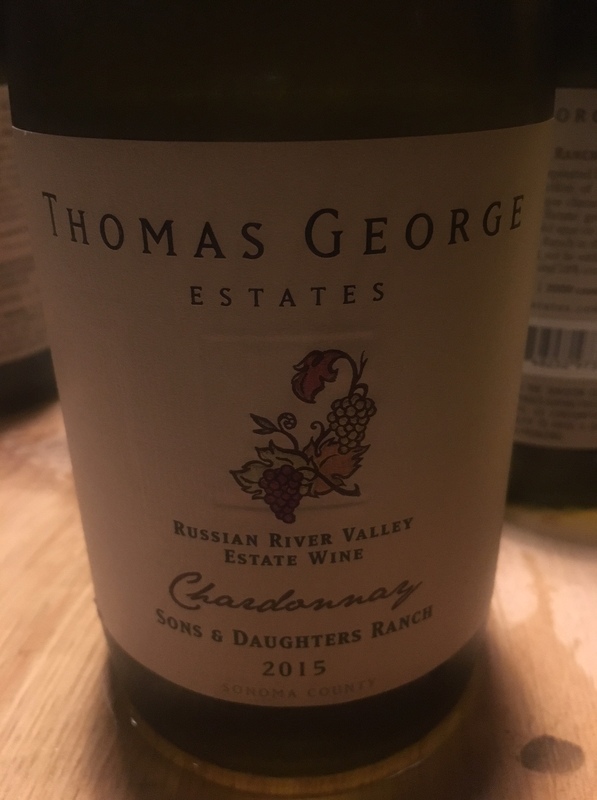 This course was paired with a 2015 Chardonnay from the Thomas George Sons & Daughters Vineyard in the Russian River Valley. The best part about this dish was the crispy bacon nuggets and Marcona almonds nestled in the salad hidden like buried treasure. Alyse and I laughed about our disdain for frisée…I did not know someone else shared my dislike of its curly texture and overall annoyingness when trying to cut/eat it. Still, this salad was a major hit with me. The entrée course was a stunning “Cracklin'” Pork Belly and Star Anise Liberty Duck. 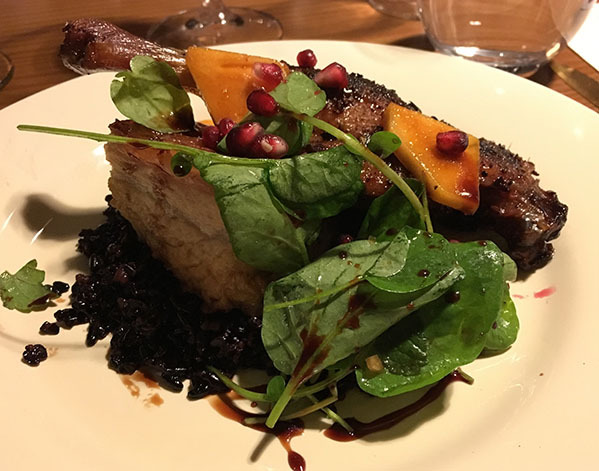 It was served with Black Rice, Thomas George Estate-Grown Pomegranate and Watercress. 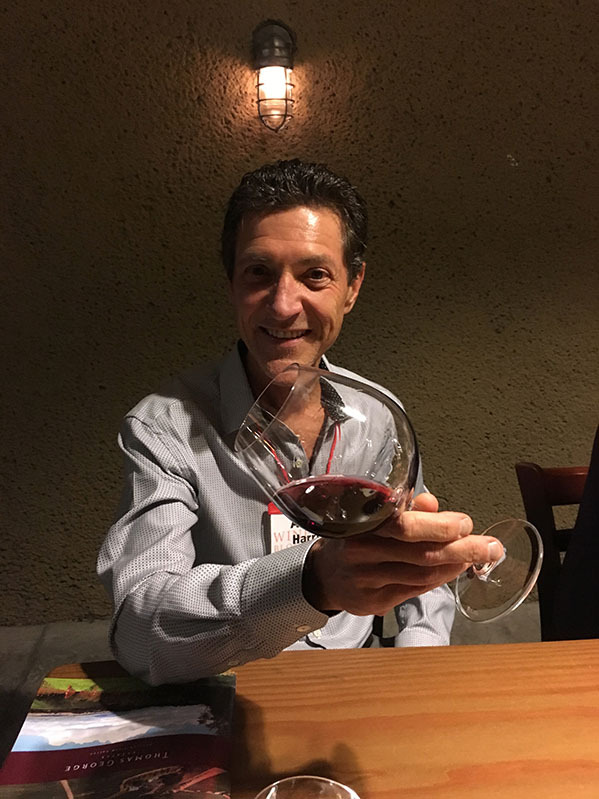 The wine pairing was an Estate 2014 Pinot Noir, Baker Ridge Vineyard, Russian River Valley. The texture of the rice was wonderfully chewy and sticky and was offset by the crispy pork skin and the tenderness of the duck leg. As you can see it was a beautiful presentation and the pomegranate lent itself in both flavor and color. There was also a bit of persimmon on the plate, special to me because Fuyu persimmon is my favorite fruit, and it was my first taste of it that season! 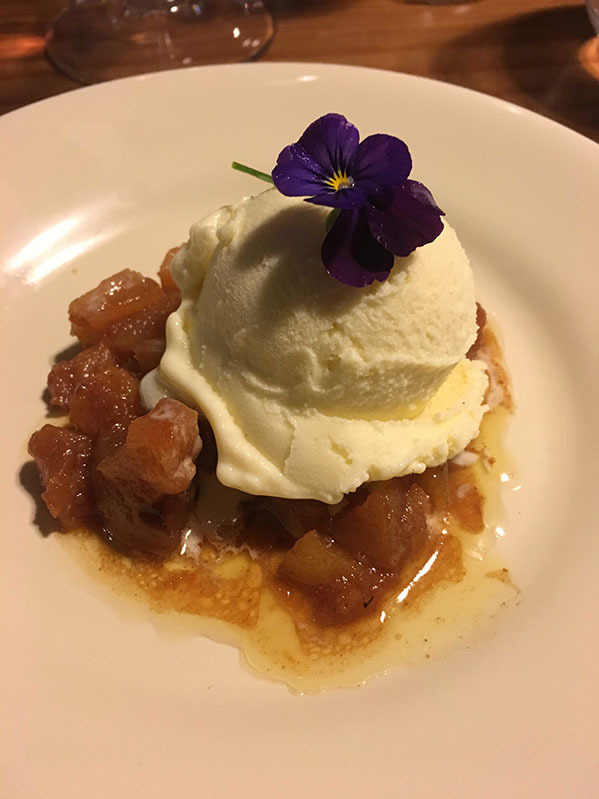 For our final course, we were presented with a Quince & Apple Tartin, served with Bourbon Gelato. I was served a dessert without the crust, as they kindly remembered my gluten free request. 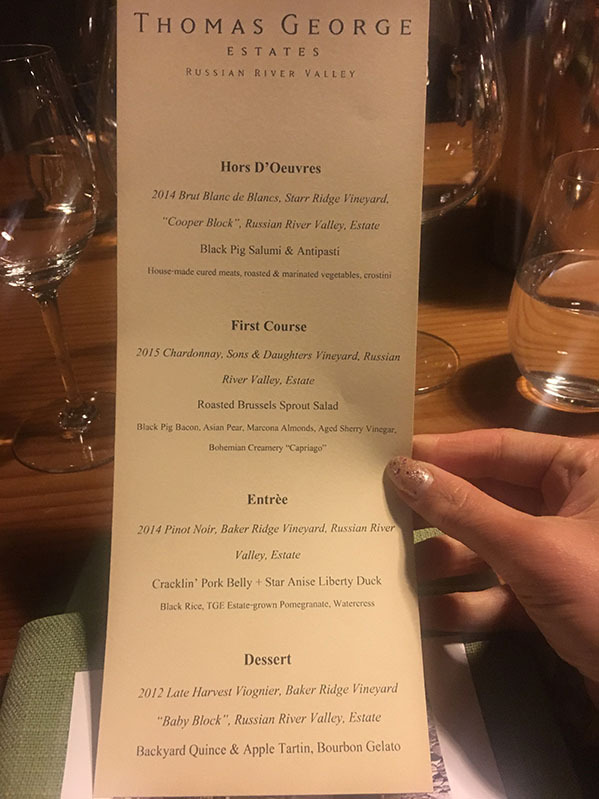 I thought the Bourbon Gelato was pretty incredible, especially with the wine we were served as a pairing: an Estate 2012 Late Harvest Viognier from the Baker Ridge Vineyard “Baby Block”, Russian River Valley. Success! The wine WAS slightly sweeter than the dessert, and that is how it should be in a dessert/wine pairing. Lately, I have come to appreciate/enjoy dessert wines more and more, and might have even purchased a few bottles of Pinot Gris in the last month. I used to hate on sweet/dessert wines (like, a lot), so here is my formal apology of sorts. 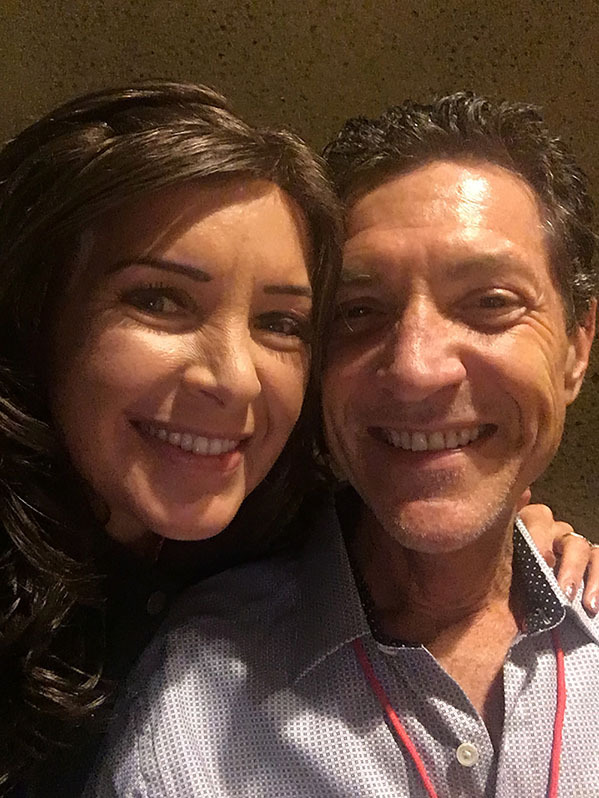 Not only were the wines and the meal terrific, the company I shared them with and the memories I have of the evening are unforgettable. 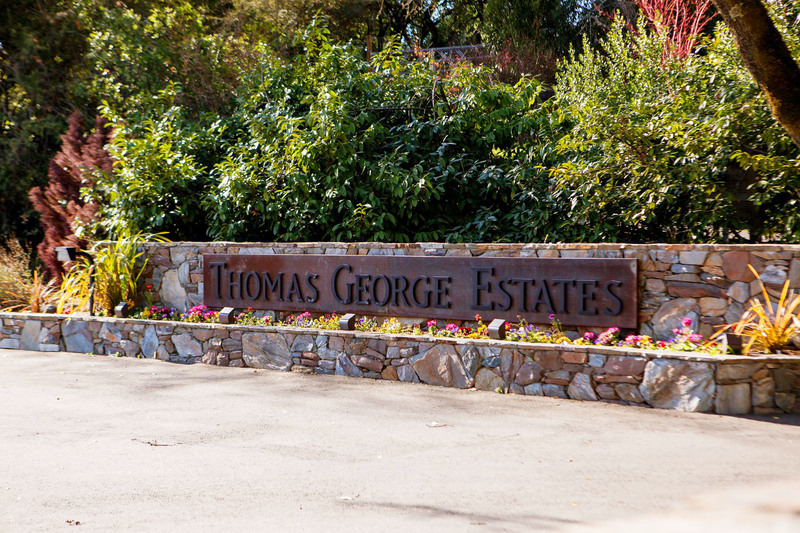 Thank you to the staff at Thomas George Estates for your hospitality and to Chef Duskie for her food presentation. 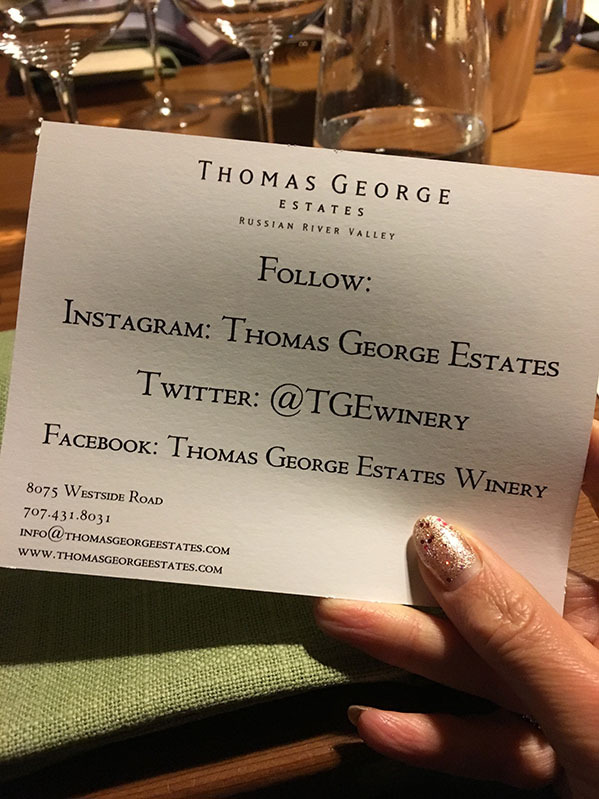 To connect with Thomas George Estates, you can find them on Facebook here, follow them on Twitter here, or follow them on Instagram here. Their website is located here. 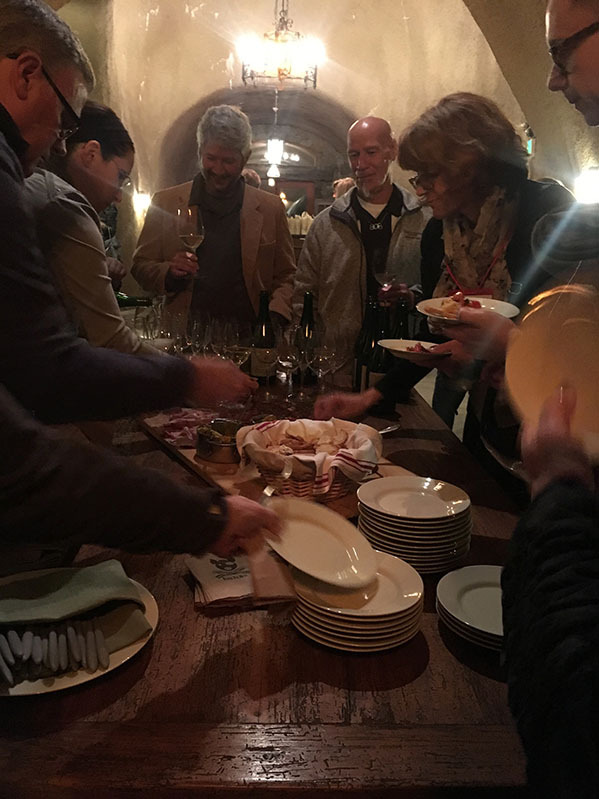 For another account of this excursion, head on over to Appetite for Wine, and read what Kent had to say! The winery is closed to the public during the month of January for annual maintenance and improvements, but will return to regularly scheduled operations on February 1st. So this means you have plenty of time to plan a future visit! 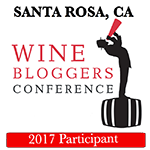 If you’re a wine blogger or play one on TV, don’t miss out on the next Wine Bloggers Conference, to be held in Walla Walla, Washington from October 4-7, 2018. 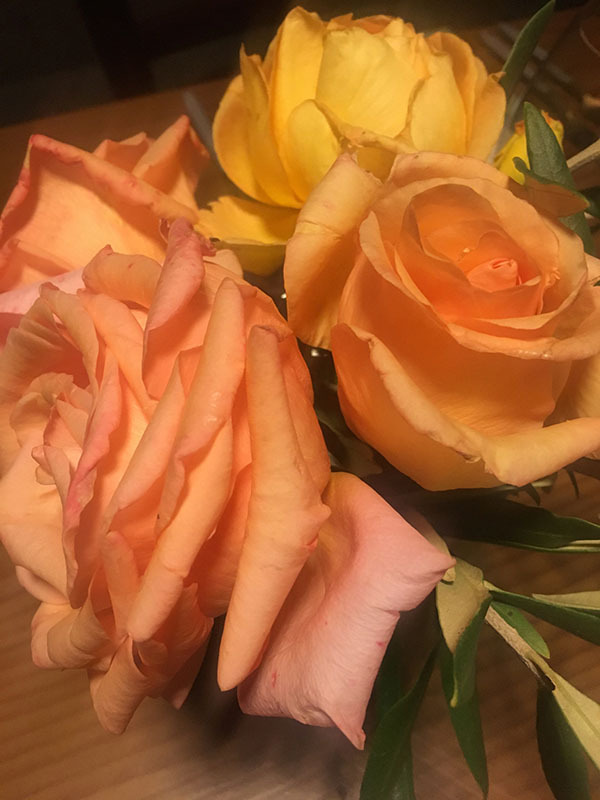 This entry was posted on January 6, 2018 by cavegrrl. 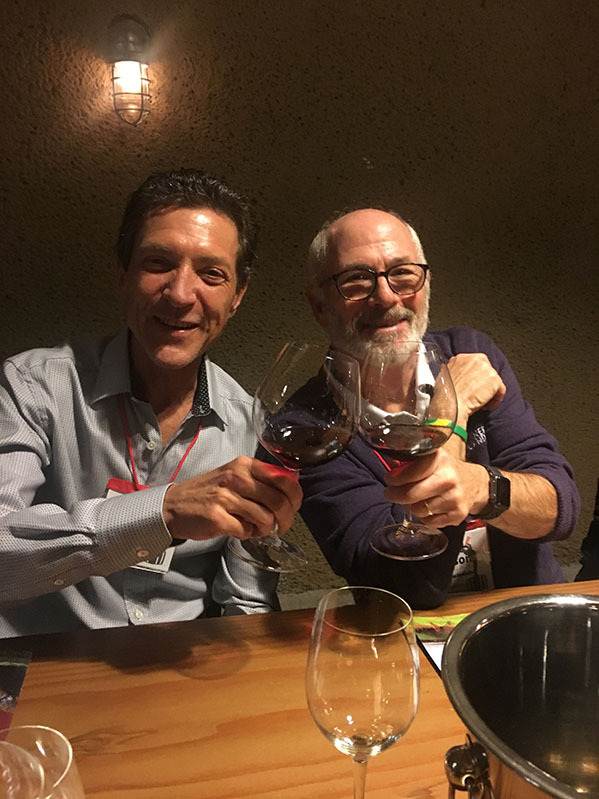 It was filed under events, food, wine, wine tasting and was tagged with food, Healdsburg, Santa Rosa, Thomas George Estates, WBC17, wine, Wine Bloggers Conference, wine cave, wine country, wine pairing dinner, winery wanderings. Ah, memories of a great night! Thanks for the link, too. Cheers! 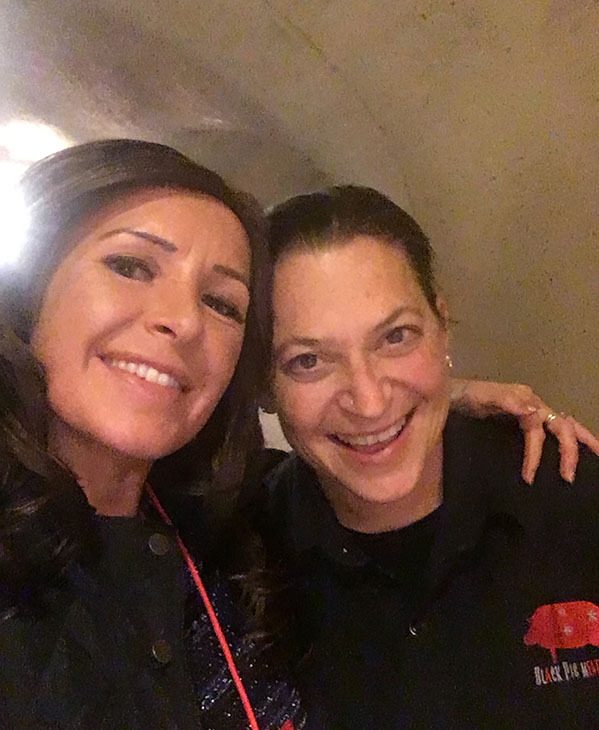 How appropriate you ended up in a cave for dinner lol! Sounds like this was a great dinner. I ended up at Martin Ray which was also a fun evening. Hope to meet you in Walla Walla next year!